Tactical two stage or National Match trigger. 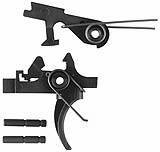 This Two Stage Trigger is extremely smooth, stable, and flexible. It may be used as a tactical two stage trigger mechanism with the safe, smooth 6 to 7.5 pound weight desired by police department officials (much like the 1903 Springfield Rifle), tuned to a smooth lighter weight "Pull Through" 2 stage match trigger or to a crisp National Match Trigger. It is the trigger now used to provide the fine match-grade trigger of DSC National Match and tactical precision rifles.